THE REVD. 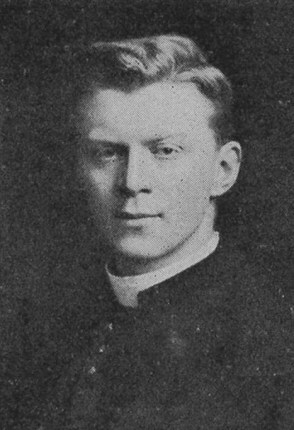 GEORGE BERNARD HAMILTON BISHOP was Vicar of Cardington, and was presented to the Living in 1914, having been ordained in 1911. He had been an enthusiastic Volunteer, and had served in the Durham University OTC (where he was a member of the Guard of Honour at the Coronation of King George V ) and The Oxfordshire and Buckinghamshire Light Infantry. He was Diocesan Secretary for the A & E Churches Union and an author on religion in Russia. He attended the King's School, Gloucester, and Durham University where he was a rowing coach. He was highly praised in a report into a boating accident on 24 February 1911 for his actions which were responsible for the saving of a man's life. 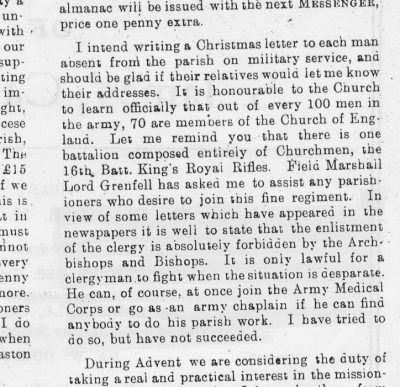 However, in July 1917 he was appointed an Army Chaplain (4th Class). His last signature as Vicar in the St. James Church Registers was on 14 January 1917 when he officiated at the baptism of Ernest Alfred Pugh of Upper Farm Enchmarsh. He was killed in action on 27 May 1918 whilst attached as Chaplain to the 6th Battalion The Northumberland Fusiliers. This was during an artillery bombardment of the trenches to which they were subjected at about 10-00 am, at Concevreux. 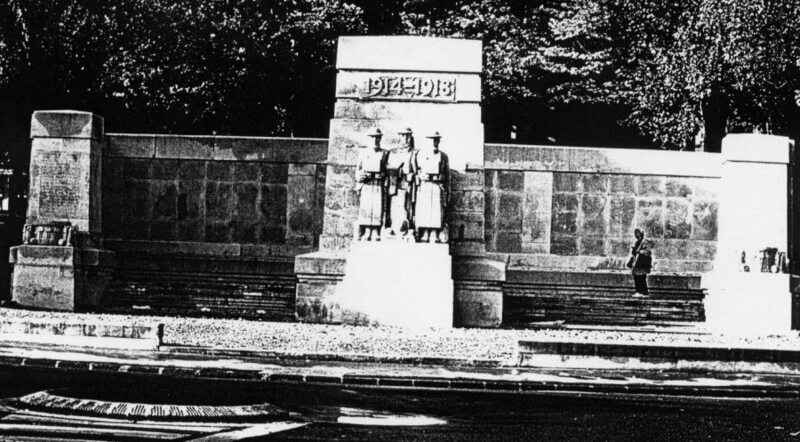 This was the opening move of the Third Battle of the Aisne, when the German forces launched a large attack and carried the Chein des Dames ridge. His death is commemorated on the Soissons Memorial (Aisne). 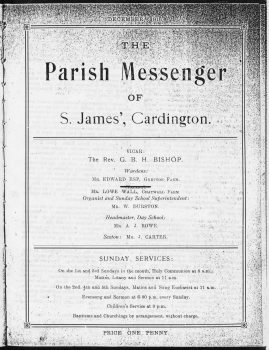 G B H Bishop is believed to be the author of the "Notes on the History of the Church and Parish of Cardington" which is reproduced on the Local_History page of this website. We are grateful to Robert Brunsdon who is an old boy of the King's School, Gloucester and is researching all the names on the school's war memorials, of whom the Revd Bishop is one, for providing the photo of George Bishop and some of the above information.